This week is all about you, oh glorious reader, and the choices you may or may not make. I just noticed how close we are to the end of the season, and I think it’s time for some audience feedback. Let me know what you think in the comments, through email, or your social media outlet of choice. What do you want to read/want me to write about next season? Is there anything specific that you’d like to see me do differently or anything you think I can improve on? Note: Whichever wins, an as-of-yet-undecided unconventional restriction will be placed upon it. So, if Azami wins it won’t be a wizard combo deck, Sakashima won’t be a clone deck, etc. I should probably have some content this week… How about modal cards? To gatherer! Oh god… There are so many of them… I’ll just talk about some highlights of each color that aren’t staples… Monocolor only, otherwise I’ll be writing all night. Solar Tide – A worse Austere Command, but still a board wipe. Can Clear out token swarms while keeping your threats alive. Piety Charm – Destroys an aura or gives all of your creatures Vigilance, seems decent… Also does something with soldiers occasionally. Fortify – Instant speed white Overrun. Why not? Alabaster Potion – Even if it’s just life, it has an X. There has to be SOME way to abuse it. Sapphire Charm – Targeted phasing out on an instant, aslo slowtrips – I could see this being put to good use on an Isochron Scepter. Temporal Cascade – I’ve never seen this played over similar effects. If it was any number of target players, it would be great. Vision Charm – Artifact phasing, mill, or weird Mana Screw-fixing… Another that could be vaguely playable. Ebony Charm – First mode does nothing, but the chocie of graveyard hate or evasion is nice. Feast or Famine – Zombie or Terror. Not optimal, but there might be a deck somewhere that wants 4drop removal. Plunge into Darkness – I don’t see this as an entwine card… I don’t really notice the first ability at all. I see that it’s an instant that costs 2 and draws cards. A great Isochron option in monoblack. Promise of Power – 5 mana, 5 life, 5 cards. Ok. Adding a 5/5 or more Demon for four more mana? Why not! Fissure Vent – Playable in monored? I want to say it is, but I doubt it. Fury Charm – Shatter, Unnatural Predation, or Jhoira acceleration. Maybe playable? Grab the Reins – Has the same feel-bad entwine as Catch//Release. Each effect is great on its own, but the fact that you don’t get full use out of the first before having to Sacrifice it to the second just rubs me the wrong way. Reign of Chaos – I’d never seen this before now. Sure it’s a limited color hoser, but I like it. 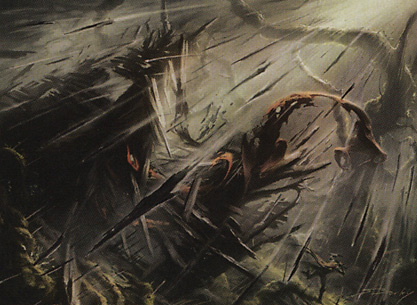 Slagstorm – Essentially a 1mode card, but 3 damage to everything for 3 mana is still decent. Crushing Vines – Artifact destruction is always good to have and you’ll probably run into a flying creature you want to kill some time. Evolution Charm – Lay of the Land, Wildwood Rebirth, or Jump. Green likes all of these. This is an autoinclude in any green deck I make. Journey of Discovery – Assure your land drops, empty your hand of lands, or dump your extra mana into getting more mana. Rain of Thorns – DESTROY ALL THE THINGS! Reap and Sow – LD and Ramp, what’s not to love? Triassic Egg – Cheat a creature into play OR Reanimate a creature. Total investment of 10 mana, but provides a way to Reanimate or cheat in a creature in any color. I love this card but have never been able to find a home for it.